Holidays your child would love. Get social with Coastal - let us help us inspire your next holiday. Memorable holidays - all year round. Lazy summer holidays are best spent soaking up the spectacular vista of the Pembrokeshire Coast. Stay in a wonderful dog friendly self-catering holiday cottage and experience the freedom to explore our picturesque county. The sun is still in the sky, your entire family is there with you to take on holiday and the ice creams are ready and waiting for you. So pull up a deckchair, soak up the sun and relax on one of Pembrokeshire's many award winning Blue Flag beaches. October is a great time of year in Pembrokeshire, with spooky goings on at historic locations and castles across the county and a countryside that has an abundance of wildlife and great views, there really is no other place to spend your half term holiday. Christmas is all about coming together and what better way to enjoy the company of friends and family, than organising your festive get-together in your very own Christmas holiday cottage. Our New Years Eve Breaks range from romantic cottages for two to great family friendly properties where even your dog can join in the celebrations! We even have groups of cottages that can accommodate up to 30 people... take a look! Welsh Valentines's Day or St Dwynwen's Day is celebrated in Wales on the 25th January. Visit the stunning Pembrokeshire coast and discover the perfect romantic hideaway for you and your loved one to celebrate this special day. This Valentines Day, treat your loved one to a wonderful romantic Valentines Break in beautiful Pembrokeshire, Wales. Immerse yourself in the historic charm of the beautiful Pembrokeshire Coast and explore castles, caves, rolling hills and rugged shores. Mothers Day is a special day, so treat your mum with the perfect Mothers Day Break; a short break away from it all in a cosy cottage on the stunning Pembrokeshire Coast. Easter is often the first chance of a family holiday after the new year, and is always a fantastic time to visit and explore the beautiful Pembrokeshire Coastline. Early May Bank Holiday is sometimes seen as the start of the summer season, and can be a great opportunity to visit Pembrokeshire - experiencing the true nature of our county in all its glory. A fantastic way of experiencing Pembrokeshire like never before. Stay in a wonderful self-catering holiday cottage and experience the freedom to explore the picturesque county of Pembrokeshire with its beaches, castles, attractions and abundant activities. Pembrokeshire's landscape is full of different terrains - there's the coves and caves worn into the cliff faces, the climbs to the top of the Preseli Hills, and the gentle countryside walks for those who just want to drift away with their thoughts. We've separated the county into four areas, so you can find the towns near where you're staying, and can explore what this beautiful county has to offer. From New Quay to Fishguard; wild, rugged, and specatcular is how one would define this area. With a multitide of little coves and caverns to explore, the north is very popular with walkers and cyclists all year round. The North West coast seems to attract the dolphins, seals and the occasional whale. 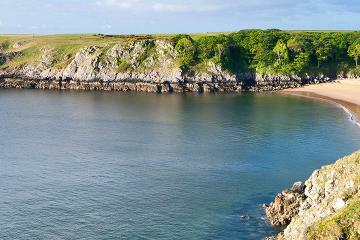 The Coast Path here offers many a walker a magical time and many of the County's finest activities can be experienced. St.Davids, the smallest City in the Country, has an abundance of fine restaurants and galleries as well as the stunning Cathedral and Bishop's Palace. The West starts in the picturesque harbour village of Solva, running round the coast through Newgale beach reputedly the finest in the County and ideal for surfing and on through the stunning bays and beaches moving up the reaches of the Western Cleddau estuary. Discover how to do Christmas #TheCoastalWay with our new video, showcasing the unique festive experience you can expect in Pembrokeshire! Holidays chosen especially for you. What's your style? If you're looking for a holiday cottage with a sea view in Pembrokeshire then look no further. Our selection of properties with coastal or sea views, including river view holiday cottages are second to none. Finding a perfect holiday for your dog can be a daunting task, that's why we've put together this comprehensive list of dog friendly holiday cottages in Wales that all accept pets. These properties are perfect for those of us who love walking holidays! Each of these holiday cottages have easy access to the Pembrokeshire Coastal Path and are great for coastal walks. These child friendly properties are the perfect location to take your toddler or small child on holiday this year. Find out the best child friendly pubs, child friendly restaurants or great beaches and fun places to visit with your little ones whilst in Pembrokeshire. Treat your loved one to a wonderful romantic Valentines Break in beautiful Pembrokeshire. Immerse yourself in the charm and history of the beautiful Pembrokeshire Coast and explore castles and caves, rolling hills and rugged shores. If you're looking for a luxury holiday cottage based in Pembrokeshire, then one of our five star holiday cottages is bound to be the perfect one for you. Our selection of large cottages include family friendly properties, cottages for groups and those that are ideal for special occasions and get togethers. Swim a few lengths every morning, teach the children to swim or let them splash around and burn up all that youthful energy before tea! © 1982-2019 Toddle Pembrokeshire. All Rights Reserved.